Non-ambient crystallography – is extreme becoming common? 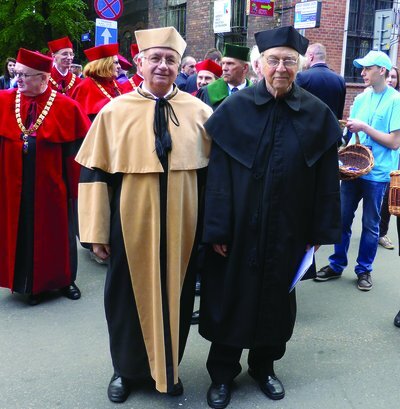 On May 10, 2014, Robert Huber became Doctor Honoris Causa (DHC) of the Jagiellonian U. in Kraków, Poland. Prof. Huber is an iconic figure in protein crystallography. Now retired, he spent most of his career at the Max Planck Inst. in Martinsried, Germany, including 33 years as its director. At the end of the 1950s, Robert Huber helped to introduce protein crystallography to the European continent; although the X-ray diffraction experiment was first done in Munich, the method was actually developed in the British Isles (by the Braggs and for proteins by Perutz), to be reimported to Munich by Huber's mentor, Walter Hoppe. Robert Huber is widely known for his titanic structural work on proteolytic systems and their inhibitory regulation, an area that also includes his pioneering work on the structure of the proteasome. Another milestone discovery, awarded with the Nobel Prize in Chemistry in 1988 (with Johann Deisenhofer and Hartmut Michel), was the determination of the crystal structure of the photosynthetic reaction center complex, which not only shed light on this light-to-chemical energy converter, but also demonstrated for the first time that integral membrane proteins can be successfully attacked by crystallography. The name of Robert Huber is also associated with a number of other methodological advancements. All these numerous achievements were recited in Latin during the Honorary Degree award ceremony. The ceremony was held at a special session of the Academic Senate of the Jagiellonian U., celebrating the 650th Jubilee of this majestic Alma Mater. The session was witnessed by ∼1600 guests assembled in the Auditorium Maximum, including highest-ranking representatives of about 200 universities around the world, and the President of Poland. The Jagiellonian U., one of the oldest in this part of Europe, was founded in 1364 by King Casimir III the Great. The inclusion of the DHC promotion in this remarkable celebration adds additional splendor to the Honorary Doctorate of Robert Huber.